Rocket up your metabolism with the next generation in natural metabolics - Fit Throid! Directions: As a dietary supplement, 2 capsules per day. Do not exceed 2 capsules in a 24 hour period. The Missing Link To Fat Loss Has Arrived. The struggle with fat loss and having a slow metabolism can boil down to having low levels of thyroid hormones... hormones that are commonly overlooked. Give your body what it needs to send fat packing with Fit Throid! 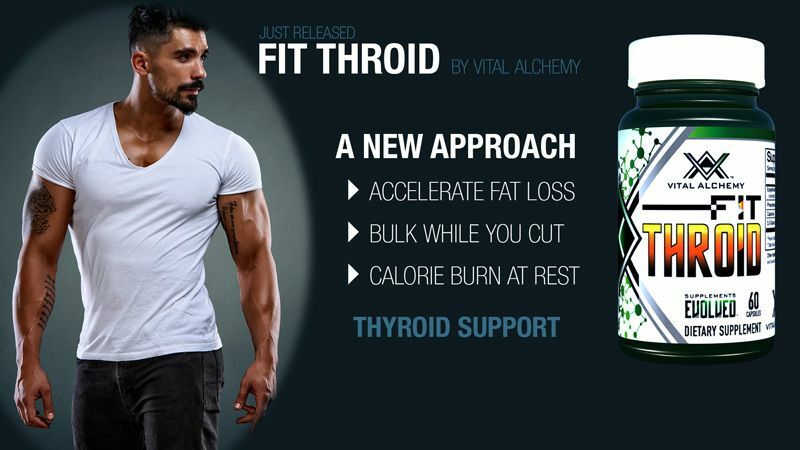 Fit Throid’s formula mimics the thyroid hormone to help increase your metabolism, curb your appetite, and activate thermogenesis while targeting brown adipose fat rather than eating away at your muscles for fuel. You can get better muscle definition without losing muscle mass. Fit Throid is part of a next generation of products in the new Natural Metabolics Category. Tackle fat loss through the road less traveled with Fit Throid! Get it now! 3,5-Diiodo-L-thyronine (T2): T2 is a naturally occurring iodothyronine. Thyroid hormones serve as a regulator that decides the speed of which each cell in your body operates. T2 is a synthetic thyroid hormone which functions like T3, but instead of damaging muscle, it only burns fat.This compound is proven in scientific studies to help increase metabolic rate and overall calorie burn at rest and enhance mitochondrial function. T2 converts slow-twitch fibers to fast-twitch fibers, allowing “endurance fibers” to convert to “strength fibers”. This allows you to become stronger while shredding fat. Additionally, increased levels of thyroid hormone may also allow a person who is consuming a higher level of calories (bulking) to stay leaner. EGCG: Epigallocatechin gallate, or EGCG, is a polyphenol found in green tea along with catechin, epicatechin, proanthocyanidins and others. Research has shown that EGCG helps to increase calorie burn and help the body use stored fat for energy and has been shown to increase fat oxidation by up to 33 percent. Phenylethylamine: Also known as PEA, this ingredient helps to increase cellular metabolism which translates into both mental and physical energy. It has vasoconstrictive effects which result in a boost in metabolism, alertness, and through epinephrine and norepinephrine, phenethylamine also helps to curb appetite. Give Your Body What It Needs To Send Fat Packing With Fit Throid! Get It Now! WARNING: This dietary supplement is intended to be used in healthy adults 18+ years of age. Do not use this product is you are nursing, pregnant, may be pregnant or are trying to become pregnant. Consult with your physician prior to use of this product. Do not use this product if you have been diagnosed with infertility, hypothyroidism, hyperthyroidism, have thyroid disease of any sort or take any medications for any thyroid disorder. Do not use this product if you have high blood pressure or have been diagnosed with hypertension. Consult with your physician prior to using this product if you have any psychiatric or neurological condition, any heart or cardiovascular condition, have been diagnosed with high cholesterol or dyslipidemia or have been diagnosed with kidney or liver disease. Discontinue immediately and seek immediate medical assistance if you experience dizziness, severe headache, or shortness of breath. KEEP OUT OF REACH OF CHILDREN.